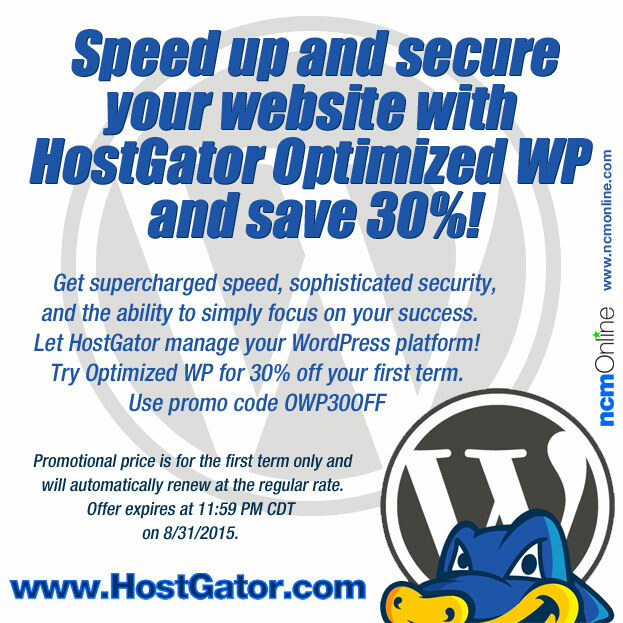 Shop now and receive 30% off new HostGator Optimized WP plans. Use promo code OWP30OFF in your cart when you order. Sale Ends: Monday, August 31st at 11:59 PM CST. Get supercharged speed, sophisticated security, and the ability to simply focus on your success; let HostGator manage your WordPress platform! Load pages faster than ever with built-in custom caching and global content delivery. Daily malware scans, automatic removal of malware, and offsite backups. Preconfigured with plugins for improved features, Google Analytics, and premium WordPress themes. Promotional price is for the first term only and will automatically renew at the regular rate. Offer expires at 11:59 PM CDT on 8/31/2015.